The sixth episode in the classic series of children's books from author Cynthia Bardes and illustrator Virginia Best. Pansy the poodle and her human friend Avery have solved mysteries all over the world―from foiling a jewel thief in Los Angeles to tracking down one of the Queen's precious corgi puppies in London. Their new adventure takes them even farther from home, on a safari in Africa, where a beloved lion cub has gone missing. 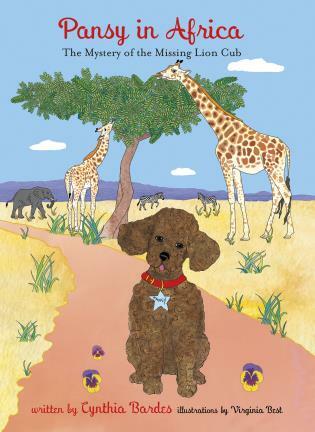 Pansy in Africa is perfect for teaching reading skills to young emergent readers ages 3 – 7. Pansy and Avery volunteer to help find the cub, and set off with their guides to follow paw prints and other clues. Along the way, they see and learn about the exotic landscape and animals of Africa, and even learn a few words in Swahili. When they find little Zuri, they discover that his talent for dancing has turned him into a movie star! In the end, they reunite the cub with his family and friends, and everyone learns a valuable lesson: It is our differences that make each of us special. Parents, teachers and librarians appreciate the heirloom-quality oversized hardcover with its extra thick pages and splendid full color illustrations. Give the kid in your life the gift of reading with Pansy in Africa. Cynthia Bardes and her husband, David, spend each fall at a Beverly Hills hotel with their toy poodle, Pansy. Inspiration for this series was born out of random misfortune. One day, when crossing Wilshire Boulevard, Cynthia was struck by a car. Her injuries required surgery and a lengthy recuperation at the hotel. While bedridden, Cynthia's vivid imagination and Pansy's popularity with employees and guests of the hotel made for a perfect story. A graduate of Sarah Lawrence College, Cynthia is a former dress designer and interior decorator. When not in Los Angeles, Cynthia, David, and Pansy, live in Vero Beach, Florida. Virginia Best is an artist whose paintings and photographs have been exhibited nationally. She lives with her husband in Eden, Vermont.